FIC corruption has caught the attention of many scholars in China. He Zengke points out, for instance, that “the prevalence of FIC corruption reveals the overcentralization of power and deficiency of the current leadership system.” . Scholars agree in general that political power in China tends to concentrate into one position, thereby resulting in FIC corruption. In their research, however, overcentralization of power remains as a vague concept without clear definitions; nor are there convincing interpretations on the process and degree of overconcentration. Consequently, some important questions are left unanswered. What characterizes first-in-command corruption? Why is an FIC capable of dominating almost everything in the government including personnel, finance and public affairs? How can FIC corruption be prevented? These questions merit in-depth analyses. This paper aims to unravel the mystery surrounding FIC corruption by examining a number of institutional characteristics of China’s political system. It argues that power concentration, and the resultant FIC corruption, is a deeply-rooted problem in China’s current institutional setting. The paper also looks into the possible political institutional innovations for containing FIC corruption. First-in-Command is a special term in China’s political system. Though different definitions of FIC exist in the Chinese academic community,6 there is no question that FICs stand at the core of the current Chinese political system with almost all major powers in their hands. The term FIC in this paper refers to the top leaders of the government at different levels, namely the Secretary of a CCP committee. According to the latest statistics on China’s administrative institutions (up to 31 December 2005), the numbers of official positions as FIC in the central, provincial, deputy-provincial7, municipal, county and township governments were 1, 31, 15, 333, 2862, 41636 respectively, with a total of 44878.8 This paper focuses on the 3,243 official positions of FICs at the five levels of governments from the central to the county, excluding the township governments due to the unavailability of relevant data. FICs have been the officials most susceptible to corruption. A good number of FICs have been punished or investigated in recent years (see Appendix). During the past 10 years, 4 FICs of the 31 provincial governments and 3 FICs of the 15 deputy-provincial governments were punished or investigated on corruption charges. There were more cases of corruption among FICs in the 333 municipal governments and 2,862 county governments though only a few are included in the Appendix. Due to the difficulty in discovering and investigating corruption, the number of the punished corrupt FICs is just the tip of the iceberg. Compared with other official position holders, FICs are more likely to escape punishment, as it is difficult to investigate allegations of the misconduct of those who sit at the top of the power pyramid. Corruption exists in different forms in China. However, FIC corruption is more detrimental to the ruling status of the CCP and the stability of the state than other types of corruption. China’s leaders have openly and frequently warned of the de-stabilizing effect of FIC corruption that could lead to the subversion of the Party and the state. Deng Xiaoping once said, for example, “the Party is at risk of failure for sure unless we punish corruption, especially corruption at the high levels of the Party.” . Jiang Zemin, the former CCP chief, talked about the problem even more often. “Corruption is the cancer in the body of the Party and the state. If we let it be, our Party, our political power and our socialist modernization cause will be doomed.” . He also suggested that “If we do not firmly punish corruption, the flesh-and-blood ties between the Party and the mass would be ruined; the Party would be in danger of losing its ruling status and the Party would suffer self-destruction.” . FIC plays a decisive role in cadre appointment. Consequently, the sale of official positions becomes the primary means of FIC corruption. Most of the corrupt FICs in the Appendix were involved in office selling. For example, Du Baoqian in his 5 years’ tenure as the Secretary of the Lushi County Committee of CCP “sold” 650 positions when handling cadre promotion and redeployment.9 When Du Baoqian was under investigation, his case implicated 80 other country officials, among whom were a member of the Standing Committee of the CCP’s County Committee and deputy-executive of the county, all the Party secretaries and chief executive officers in the county’s 19 townships.10 As a result, the entire county government collapsed. The case about Ma De is another example. Ma, the former Secretary of the Suihua Municipal Committee of CCP, Heilongjiang Province, not only sold but also bought official positions. Implicated in his wrongdoing, several provincial leading officials such as the Deputy Chairman of Heilongjiang People’s Political Consultative Conference and Director of the Organization Department of the Heilongjiang Provincial Committee of CCP and more than 10 county officials in Suihua City were sacked.11 As illustrated by these cases, the corruption of just one person, the FIC, can implicate many other officials, pollute a government, and paralyze the entire institution. It is therefore safe to say that no other corruption in public office can bring more damage to the whole cadre corps than FIC corruption. While FIC corruption represents the most destructive kind of corruption, it is probably also one of the most difficult forms of corruption to tackle. FIC corruption is not just a personal malady. A probe into the causes of FIC corruption reveals the defects of China’s political institutions, both formal and informal ones. FIC corruption may be attributed to a number of factors. In the Chinese academia, some believe that the influence of China’s traditional culture and long history of feudalist society is to blame for the ideas of hierarchy and bureaucratic superiority that are deeply embedded in the mindsets of many officials. These cadres consider themselves superior and regard top-down supervision as being fault-finding and bottom-up supervision as boat-rocking . Many FICs simply do not have the sense of self-discipline and are blind to suggestions and advice . Secondly, opacity of government affairs or absence of transparency incubates corruption . When decision-making is not an open process, external supervision will be difficult or even impossible. FICs themselves make final decisions arbitrarily in spite of disagreement. Sometimes, they conceal what ought to be open to the public in the name of confidentiality and intentionally block the channel for public supervision. Thirdly, weak supervision further nourishes FIC corruption. The structure of supervision should be shaped as an invert pyramid. The more power a person possesses, the more rigorous supervision he or she should be subject to. Unfortunately, this is not the case in China’s current political system, where FICs are largely out of institutional surveillance. The situation is summarized by a vivid saying in China that “supervision from the above is too far, supervision by colleagues is too risky, supervision from below is too weak, and supervision by law always comes too late.” . Finally, power is highly concentrated into the hands of FICs. Being the head of a leading team at different levels of the government, an FIC plays a vital role in all governmental affairs without distinctly defined power boundaries. An FIC may impose his authority on everywhere and everybody if he wants to, turning collective leadership into one person’s arbitrary power. Though concurring with the above analyses, we also believe that power concentration in some localities in China developed to such an extent that an autocracy of FIC has been created. This autocracy has little to do with personal attributes. Rather, it results from the specific political institutions of China, as illustrated in Fig. 1. By institutions, we mean both formal and informal ones. The former refers to official institutional arrangements stipulated in the Party Constitution, the Constitution of the People’s Republic of China (hereafter, the PRC Constitution), or other special laws. The informal institutions in this paper differ from those defined by new institutional economists. The informal institutions in new institutional economics refer to the guidelines established by usage and observed by people during their social life, including values, believes, custom, ethics [10, 11]. The informal institutions in this paper, however, mean the nonfigurative institutional arrangements which are not specifically stipulated and might be carried out in different forms due to the differences in leaders’ will. The key components of China’s political system include the People’s Congress system, the Pparty system, and the government collective leading team system, as stipulated in the PRC Constitution and the Party Constitution. The People’s Congress system The PRC Constitution stipulates that “[t]he National People’s Congress of the People’s Republic of China is the highest organ of state power.” (Article 57) and that “local people’s congresses at various levels are local organs of state power.” (Article 96) Deputies to the people’s congresses above the country level are elected by the people’s congresses at the next lower level, while deputies to the people’s congresses below counties are elected directly by their constituencies, according to the Election Act of the National People’s Congress and local people’s congresses. The people’s congresses at different levels elect and appoint the leaders and other leading members of the governments, courts and procuratorates at the corresponding levels. They also have the power to recall incompetent officials. The Party system At the core of China’s Party system is the ruling status of the Chinese Communist Party. The CCP’s ruling position is repeatedly accentuated in different sections of both the PRC Constitution and the Party Constitution. The CCP system, in parallel with the congressional system, includes the Party Congresses at various levels and the Party committees and commissions for discipline inspection elected by the Party congresses. The Party Constitution refers to the National Party Congress and the Central Committee elected by it as the highest leading bodies of the Party, and the local Party congresses and the Party committees elected by them as leading bodies of local Party organizations. Local Party committees are responsible, and report their work, to the Party congresses at their respective levels. Although the Party committees and commissions for discipline inspection at all levels are elected by the Party congresses at the corresponding levels and have the same source of power, they are not equal to each other. The commissions for discipline inspection function under the leadership of the Party committees. According to the Party Constitution, the commissions for discipline inspection operate under the dual leadership of the Party committees at the corresponding levels and the next higher commissions for discipline inspection. Figure 3 shows the organizational structure of the ruling party system in China. The CCP’s ruling status is supplemented by the system of multiparty cooperation and political consultation under the leadership of Communist Party. In this system, the CCP plays the leading role as the only ruling party, while the eight minor political parties cooperate with the CCP and take part in the decision-making of the government under the CCP’s leadership. Some deputy positions in the state apparatus are taken by representatives from the eight minor political parties, as well as by people from all walks of life, and the CCP consults them on general state policies and crucial political, economic, and social issues. The Political Consultative Conference is the organizational form of multiparty cooperation and political consultation. The collective leading team system A collective leading team is formed in the government at each level. The team involves a very small number of people with its membership confined to the CCP only. At the central level, the collective leading team consists of the standing members of the CCP Politburo, while at the local levels the teams are composed of members of local standing committees of the CCP. The collective leading team system is an important institutional arrangement based on the Leninist principle of democratic centralism. The CCP adopted this principle in her founding years and wrote it into the China’s Constitution. However, democratic centralism is merely a nonfigurative principle because there exists great flexibility or uncertainty in implementing the doctrine.19 The collective leading team system founded on the principle of democratic centralism is an informal institution, which changes greatly in practice, often due to the different leadership styles of individual leading cadres. However, the system serves the purpose of centralizing the power of the Party and the state into the hands of a small number of high-level cadres who are on the leading team first and then FICs. Figure 4 illustrates the process of power centralization. As it shows, the courts and the administrative systems are supervised by and accountable to the people’s congresses. At the same time, however, the people’s congresses, the administrative organs and the people’s political consultative conferences all function under the CCP’s sole leadership. The key to understanding how the leadership is exercised in such a complex system is the collective leading team system. A collective leading team consists of themajor leaders of the Party committee, the People’s Congress, the administrative organ and the people’s political consultative conference. This structure grants the collective leading team the absolute power over the parties (CCP and eight more different political parties) and legislative, administrative and judicatory organs. Take the collective leading team in the central government as an example. In 2002, the First Plenary Session of the Sixteenth Central Committee of the CCP elected a ninemember Standing Committee. Among them, Hu Jintao is the CCP General Secretary. Other members come from the Central Committee of the CCP, the State Council, the National People’s Congress, the National Committee of the Chinese People’s Political Consultative Conference and the Central Commission for Discipline Inspection of the CCP respectively. The collective leading teams of local governments have the same structure as that of the central government. Because the collective leading team includes the principals of all the important Party and state organs, the first round of power centralization is done at this point to allow the leading team to exercise all-inclusive authority over any institutions. Then comes the second round of power concentration where the power of the collective leading team gets centralized into the FIC’s hands. It is done through some decision-making procedures in favor of those in the top positions. There are generally two decision-making methods: one is by vote, namely the democratic rule (or the vote-deciding rule in this paper), and the other is called the “gestating rule” which is more common in China’s current political context. Ideally, under a collective leadership system, important decisions should be made under the vote-deciding rule. If it is put into practice, the vote of the FIC carries the same weight as that of the other members of the leading team. However, this vote-deciding rule is not practiced by most collective leading teams. They use the “gestating rule” instead. When a vote is taken, the vote cast by the Party Secretary turns into a “golden” one, which weighs more than the rest of the team. Table 1 shows a comparison between the two decision-making methods . An unequal weight distribution between the two decision-making rules can be found in ways the votes are cast. Under the vote-deciding rule, each voter is able to exert his voting right and express his or her real volition in virtue of the complete secrecy of voting. This procedure makes every vote equal, regardless of a voter’s rank or position. The gestating rule is different, though. Because voting is an open process, those who disagree with the Party Secretary would unlikely or even never show their real opinions. Such a decision making rule enables the FIC of the leading team to exercise absolute power. The above institutional analysis reveals the process of power concentration into the FIC’s hands. It is done first by combining all major powers of the ruling party, legislature, administration, and judiciary into the collective leading team. The power of the collective leading team, then, gets personalized in the role of the Party Secretary. This is exactly what many scholars have referred to as “excessive centralization of power” in China. The institutional explanation provided above not only sheds light on the vague concept of “power overconcentration” but also helps trace the roots of the problem in China’s current power structure. Many countermeasures against FIC corruption have been proposed. For example, it is believed that political education should be reinforced to improve the principals’ lawful exertion of power. All government employees are required to abide by the principle of transparency, which is a powerful weapon to contain corruption and to safeguard social justice . These measures may help alleviate the problem of corruption to a large extent and in the long run. However, now that FIC corruption results mainly from flawed political institutions or power system, it is important to repair the institutional defects in search of corruption control. There are four major proposals concerning institutional reform aimed at combating FIC corruption. The first is to cancel the collective leading team system. This is a straightforward countermeasure. Since the autocracy of FICs is attained through the collective leading team system, canceling this institutional arrangement becomes a logical choice. This simple and direct solution may bring about quick results for curbing FIC corruption. However, the sudden removal of the collective leading team system may result in a “power vacuum” and even political instability given China’s long history of centralized rule. To be discreet, the best way may be to carry out experiments in some local governments before dismantling the whole system. A second proposal focuses on reforming or repairing the collective leading team system by adopting democratic decision-making rules. Three democratic rules are suggested. First, all the members of a leading team participate in the decision-making process under the rule of “one vote per person”. Each of them holds an equal vote, so every one plays the same role. This prevents the overweight of the FIC’s decision-making power. Secondly, all the members participate in decision-making but not all of them have the same vote. For instance, members of the leading team except the team head vote first. The team head votes if there is a tie. Thirdly, part of the team members participate in decision-making and the remaining members exercise the veto power. The members on behalf of executive agencies may take part in decision-making while those from non-executive or supervisory agencies do not participate. They take the supervisory responsibility instead. Any of the three democratic decision-making rules may repair the structural defects of power overconcentration. They can prevent FIC corruption by breaking down the power of FICs. In fact, some local governments have already implemented such reforms,20 which have been proved effective in preventing FIC corruption. This countermeasure is less radical than the first as it helps ensure decision-making efficiency while reducing the risk of FIC corruption. However, there is still the possibility that the rules are not effectively implemented and therefore fail to achieve the desired goals. Accordingly, more profound measures should be taken to carry out overall reforms of the power structure. Since the CCP is the core of China's political system, reforms and innovations concerning the ruling party are critical. Creating an inner-Party power balance system is the focus of the third proposal. A practical scenario is to reform the current system in which the commissions for discipline inspection are placed under the dual leadership of local Party committees and the discipline inspection organs at the next higher level, because this institutional arrangement does not allow discipline inspection to be effectively exercised over FICs. Only with more autonomy, can the discipline inspection agencies break down the autocracy of FICs and prevent FIC corruption. To achieve this goal, the Party congresses at various levels must function as the highest leading organs in the Party,21 which the commissions of discipline inspection report to, rather than functioning under the leadership of the local Party committees. This proposal separates the powers of decision-making, execution and supervision, thus ensuring the independence of the supervisory power and curbing FIC corruption. In addition, this reform may not meet too much resistance from the officialdom. The authority and independence of the inner-Party supervisory system have in fact improved throughout the CCP history. 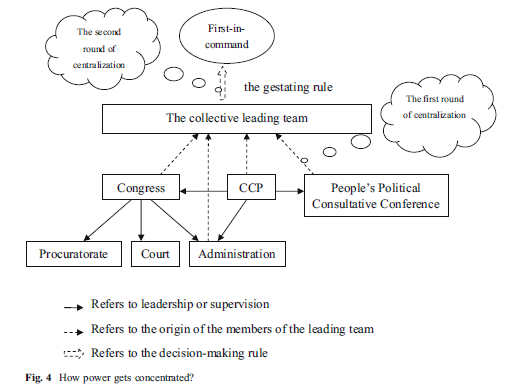 However, although this measure may help with power diffusion within a party organization, it is not designed to reduce the CCP’s overall power. Moreover, this proposal is rather difficult to implement because it requires the amendment of the Party Constitution. A more feasible option may be to enhance the vertical leadership system of discipline inspection by allowing the system to recruit its own corps so as to increase independent discipline inspection. The fourth proposal centers on the development of inner-Party democracy, which will lead to democratic elections of the Party Secretary at various levels. The democratic election of the Party Secretary should meet the following requirements: it must be a competitive election with at least two candidates; the Secretary must be elected directly by all the Party members; secret ballot must be used in voting; the Secretary, while elected, is mainly responsible for policy execution and serves on a limited term; major members of the executive team may be nominated by the Secretary but must be confirmed by votes of confidence of the delegates; and the Secretary can be removed in a certain process by the delegates or all the Party members. This last proposal works toward power de-concentration and enables effective supervision over FICs. Undoubtedly, the democratic reform of the ruling party is difficult, time-consuming and full of uncertainty. However, the inner-Party democratic reform should be given priority vis-à-vis other possible remedies. In sum, all the four countermeasures are aimed at containing the power of FICs, though with different foci. The first two are pertinent to the core institutional arrangement of power concentration - the collective leading team system, while the latter ones focus more on the necessity of inner-Party democracy or reforming the Party system as a whole. All the four scenarios have certain merits of their own and can be combined together to function in a more progressive way. In the short term, the second countermeasure should be given priority. In the mid-term, the third one can be put into practice. The fourth one may be carried out gradually in the long term. When the long term objective of China’s political reform is attained, it will be feasible to abandon the collective leading team system.